- Tangled Threads -: A naughty new start! ...the only thing I had to buy for the this SAL was some fabric, because although I have, cough, cough....one or two (ha ha) pieces of fabric in my stash, I didn't have any 14 count white aida...go figure! The border was released first and then the cake motif the following week. 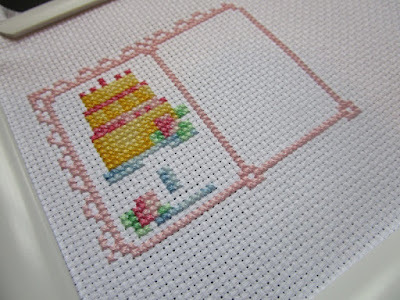 Since I was already a week behind, I decided to stitch the border and cake together. 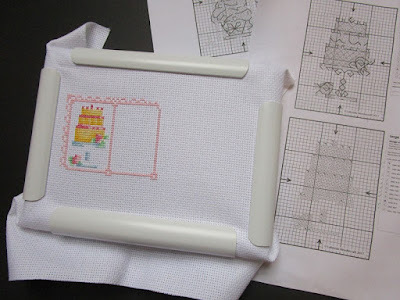 I'll just continue each border part as and when the cake motifs are released. Since all my stock of stitched cards was used, it's great to have a card already finished for when I need one. Hopefully I can start building up my stock of cards again. The first part of the Tea and Cakes SAL would also make a nice little motif to stitch for a card....guess I might be stitching this design again! That's a great SAL that you started stitching. And yes, these cake motifs would be great for cards, too, especially birthday cards. Lovely stitching!! The fizzy Moon design is cute! Durene's latest SAL is going to be another great success! Fantastic new start. Love your Fizzy Moon card finish too. Rhona, I love that new SAL. I've seen several people starting it. That cake looks so delectable. I also really enjoyed your Fizzy Moon card. It's absolutely adorable. Murphy 's law you'll always be missing the one piece you actually need! 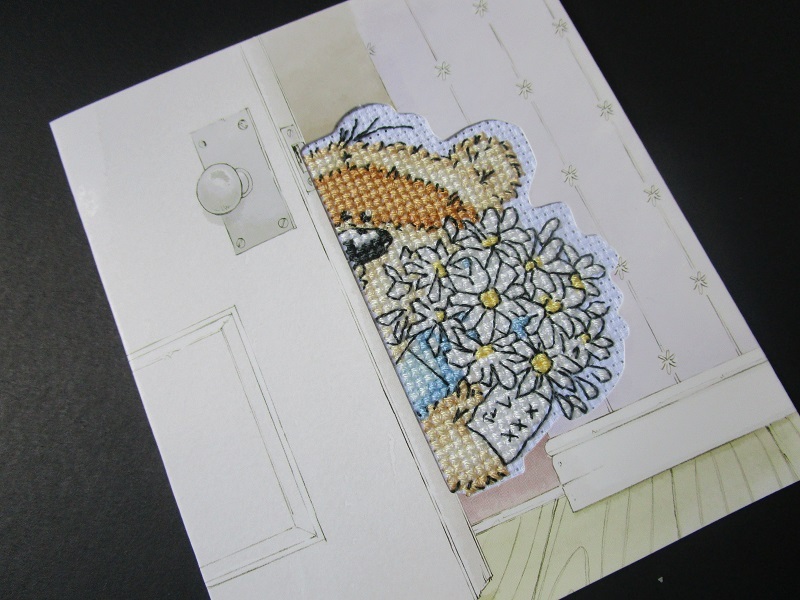 Your SAL looks gorgeous on the plain white fabric- sometimes simple is best! I was tempted by this one too. I've stitched all the border and the first cake. 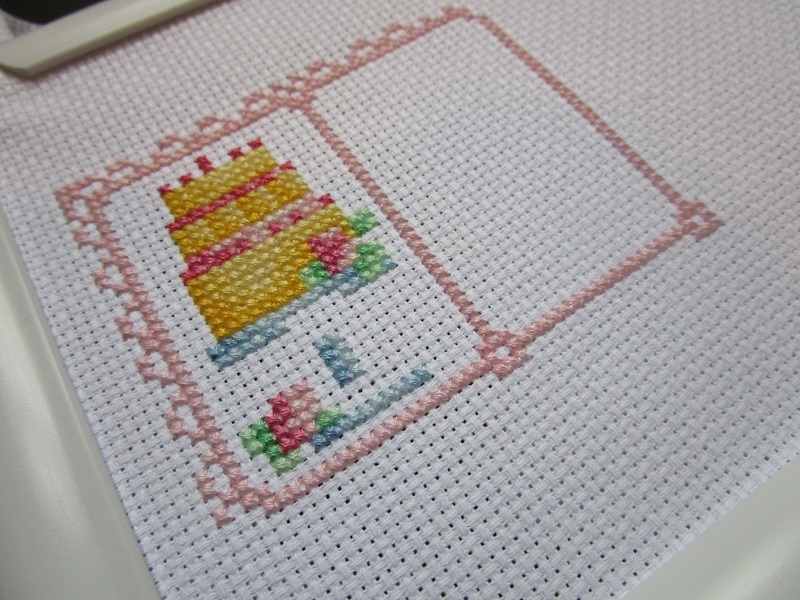 I'm sticking with the recommended thread colours and stitching on a random piece of creamy pink 16 count aida. There are some weird and wonderful colour combinations on the SAL page! The SAL design is so cute , no wonder you were tempted to start. Durene's designs are often too cutesy for my tastes but I really like this one. I even joined the FB group!